The EU and Russia are no longer strategic partners, why? A former Italian Foreign Minister Federica Mogherini appointed as EU’s foreign policy chief on 30 August 2014 stated publicly about it. This official statement regarding one of the important areas of international relations, obviously, will determine the foreign policy of a new team of the European Commission. However, the question arises whether such a change is necessary for Europe? Will it be for the benefit of Europeans, and could it help reducing the risks of new shocks of the European economy, which only began to recover after the recent crisis years? And answers here may be different. That, Gentlemen, depends on how to look at it. If we have a look from a policy making point of view, then there exists a great deal of experience in dramatic changes of inter-state relations often based on flimsy political grounds. That periodically occurs. But for business activities this kind of sharp curves in international relations are fraught with serious consequences, and in fact they should be avoided as much as possible. Some of you are probably far from business and cannot realize fairly well both complexity and significance of this situation. Then let us imagine that you are sailing a boat and suddenly try to make a drastic turn in the direction of your movement. This maneuver creates a high risk that you will lose your balance and overturn. In the same way, similar rash acts in international relations can turn upside down even a successful and stable business that will suffer an undeserved damage. Therefore, for many people in Europe and for me as well it is very doubtful of that the EU is losing Russia as a strategic partner and that it is a realistic statement, because we see it far otherwise both in theory and in everyday life. As to theory, almost any university student in Europe should learn from courses of "Business Administration" or "Corporate Governance" that in business a strategic partnership means a mutually beneficial and long-term commitment between organizations. This partnership is accompanied by investment process, exchange of various assets, joint work to strengthen their market position. And all that is going on for many years. Meanwhile in practice, we are witnessing now a serious undermining of strategic business relationships, imposing of economic sanctions as a tool of political pressure that, I would like to emphasize, creates significant problems for business partners. In this case, we are talking about our European Union and Russia. Currently, our politicians' activities, especially in Brussels, cause a great concern and displeasure in European business circles. It happens because European business for its part sees no reasons to freeze its long-term partnerships in Russia. And the more so as European business dealing with Russia is against such rash political acts and sanctions that endanger to turn "upside down" many strategic projects that have been developed with mutual benefit for many years. An outstanding example is the position of the Association of European Businesses (AEB), which brings together hundreds of European companies working with and in Russia. There are many well-known international energy companies among AEB members, including Dutch companies Gasunie and Shell E & P, French GDF SUEZ, German companies Wintershall and E.ON, Italian companies Eni and Enel and others In September the AEB sent official letters to all 28 Heads of States and Governments of the EU, as well as of Russia and Ukraine with request to protect foreign investors from both sides from any further restrictive measures. It is stated in the letter in particular that there are members in AEB with businesses in sectors, which would be directly affected by these measures. Further on the letter read as follows “the introduction of such measures could lead to a serious decline in production volume and the number of workplaces, affecting not only the manufacturers themselves, but also suppliers and retailers working in these sectors. All this would harm not only the business of the companies concerned, but also fiscal revenues through the loss of tax and duty payments. The AEB strongly requests EU and Russian authorities to protect foreign investors from both sides from any further retaliatory measures”. In other words, to protect against those forces that are stubbornly trying to cause troubles between the European Union and Russia and to undermine mutual economic relations, which was built for the last decades. Therefore, it is a matter of urgency to realise the importance of this situation and as a result to demonstrate on the contrary a political goodwill by supporting strategic partnerships of European Businesses in Russia. Now you can see that currently such pressure on international business partnerships are rather illustrative of the energy sector, where the EU and Russia have reached significant results. Due to a high share of Russian gas in the total EU consumption as it was mentioned in previous articles Russia holds the first place among gas suppliers, although only slightly ahead of Norway. 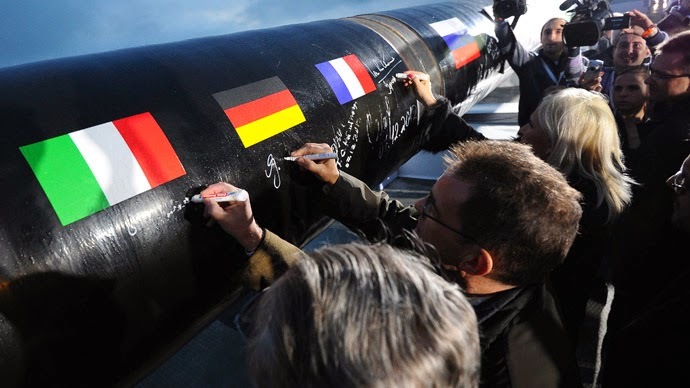 In Brussels, it is commonly known, this fact is indicated as something containing a threat to our energy security. However, it is beyond our doubts that in previous decades the imports of energy products from Russia went up entirely under conditions of mutual economic interests. That was correct for energy prices too. For example, the official report on statistical analysis of EU trade in energy products, with focus on trade with Russia says the unit values for Russian imports of the two most important products - crude oil and natural gas in gaseous state - were of a similar size to those for the EU’s other trade partners in these products. It's interesting to note that the relative importance of the EU in Russian exports of energy products decreased over the period 2005 - 2012, the same report points out. This means that Russia is also diversifying the geography of export deliveries of energy products, including natural gas. It reminds us how several years ago European energy companies enthusiastically discussed their participation in the project devoted to the Shtokman gas field development in the Barents Sea with subsequent deliveries to Europe. But later on Russia changed the geographical priorities in further development of production and exports of gas commencing new projects far to the east of the country. But we see this process of gas flows relocation not only on the east. Expansion of energy supplies especially routes aimed to South and South-East Europe now provides for a real opportunity of obtaining a reliable gas flow from Russia thanks to construction of South Stream gas pipeline, which is being built to bypass a very unstable region of Ukraine. No wonder many of us who are following the situation would like to join the call of European business for reducing a political rhetoric of Brussels politicians on cancellation of strategic partnership with Russia, which is being alleged in support of Ukraine. The ratification of the EU-Ukraine association agreement by comparison with a political impulse of reducing the strategic partnership with Russia in energy sector now looks like as an exchange of Russian gas for Ukrainian schnapps. We could hardly imagine that anybody does not understand the irrationality and the disparity of such an exchange for Europe. I am confident that just as business consumers of gas so too owners of households in our countries do realize that if the EU energy market would be at least partially "liberated" from the so-called Russian gas dependence, a vacant place will be occupied by other energy supplies mostly imported at new prices well above the former prices. Meanwhile, EU Trade Commissioner Karel De Gucht has recently stated once again that he would want to see oil and natural gas exports from the US to Europe included in the forthcoming transatlantic trade free trade zone and that allegedly Europe wants US oil and gas to help offset its dependence on Russian energy. And what is more the high level representative of Brussels pointed out that it should generate a pressure on Russia due to a downturn in world energy prices. But to expect a decrease in world prices as the phrase goes, indulge in wishful thinking. A prevailing majority of experts argue against anticipated downturn trends of world prices of energy in a near future. In conclusion, I would like to quote the words of the well-known American economist Michael Porter: “The essence of strategy is choosing what not to do”. The question remains: why to be exact does not do it?